run jen run » Y or N? We haven’t actually met, but based on Pickles, Sometimes Rabbit, Whore Eyes, the semi-annual feline renaming, “Never a Bride,” and much, much more, I’d have to say… Yes! We’ll have to convene somewhere it’s legal if you want it be all legit though. Wait. What’s your insurance policy like and will you keep that creepy rabbit head? claire: awesome! should we do canada, california or massachusetts? i want to try poutine, so i vote for toronto! churlita: good medical, so-so dental, and love me, love my rabbit head. 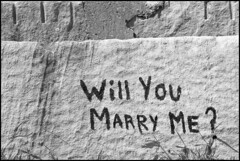 dave2: i will always have lust in my heart for the puppet-bikers, but i would never betray the sanctity of a marriage proposal scrawled on a rock wall. kat: see… if i thought you’d say yes, i would’ve kept that lovely ring i found in the train station. Now see, after reading all these comments, I begin to suspect maybe you’re just in love with the idea of marriage and not really in love with me. Plus, I didn’t see the mention of scotch anywhere. Sorry Jen, I’m washing my hair tonight. I think I’m a little old for you. Otherwise I’d fight my way to the head of the line. Absolutely. but have you stopped to consider how magnificiently curly-haired our offspring would be? do you think the world is ready for that many kilocurls? avitable: adam, you’ve made me the happiest polygamist this side of salt lake! shari: i’m working on writing my vows, and trust me, scotch is mentioned every other line. serap: you don’t have to let me down easy… i know you just washed your hair yesterday. delmer: well that’s just great. now where am i going to find another husband named delmer? you were my only shot! vahid: OMG – i hadn’t really thought about that. that’s a pretty huge responsibility – you know that people will treat the kilocurlbabies as mutants. just like the x-men. yes. if you’ll have my dog. Was there an answer posted somewhere? Someone’s name?